Marketers tend to get very caught up in thinking about how to persuade people to buy a product or service. Which makes sense … but it’s often jumping the gun. Because it’s quite common (and perhaps increasingly so) that we have to market our ideas — and connect our beliefs with those of our audience — before we can do any business. Which is why, for my money, one of the greatest content marketers working today is astrophysicist Neil deGrasse Tyson. Or even worse, scientific literacy. Challenging your own confirmation biases and saying good-bye to certainty. Yeah, that’s a door-buster. Here are some things (that are not astrophysics) that Tyson is very smart about — with thoughts on how you can put them into play when you’re speaking with passion about the ideas that matter to you. I liked this one so much that I stole it for our post image above. We should all build libraries of thought for ourselves, not knowing how we might use them in the future. The videos in this post and quotes that go with them, by the way, come from this Fast Company interview. 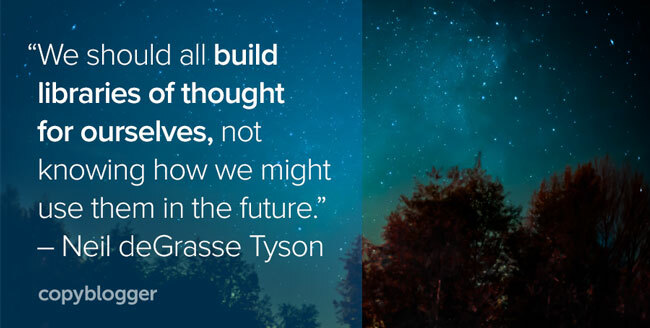 From his Cosmos special to his new TV show, books, Twitter stream, and podcast, Tyson is a powerful spokesperson for cultivating a sense of wonder. One thing Tyson is exceptionally good at is balancing the technical stuff with a lot of interesting, funny, and accessible material. Some people doubtless call it fluff — but it’s what lets him communicate complex ideas to people who don’t have his background. A lot of energy is invested in the juggling of information — packaging it in a way that when the viewer sees it, they can embrace how it has just been stitched together. So Star Talk is a blend of science, comedy, and pop culture. Making your ideas accessible isn’t the same thing as trying to please everyone with bland, safe Cream-of-Wheat statements that offend no one. Tyson takes aim at ignorance and pseudoscience, and he doesn’t pull his punches. He’s no stranger to the sharp quip, and he’s good at them. The easiest way to get other people to listen to you? Have a sense of humor about yourself. Funny people are interesting, and interesting people get to share their ideas. By the way — if you’re offended at the whole idea that a pure, noble scientist like Neil deGrasse Tyson could be thought of as a (shudder) marketer, take a look at this YouTube video. An impassioned speech that Tyson made to Congress has had some music and imagery added — turning it into a hell of an ad for Tyson’s ideas. Audacious visions have the power to alter mind states. Stay curious. Believe in what you do. (If you don’t — find something that you do believe in.) Deliver your message with wit, integrity, and a sense of humor. And keep looking up. That’s where the stars are. Previous article: Does Audio Create Authority Faster Than Text?